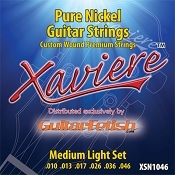 This is a FULL CASE of TWELVE Sets Excellent Quality Strings at the lowest price around! A TRUE Pure Nickel set- NO plating... just nickel through and through. Nickel strings give you a remarkably warmer, more vocal tone. These are exceptional when combined with our better single coil pickups like our professional series. Pure, warm and very smooth- the ultimate bluesy set!